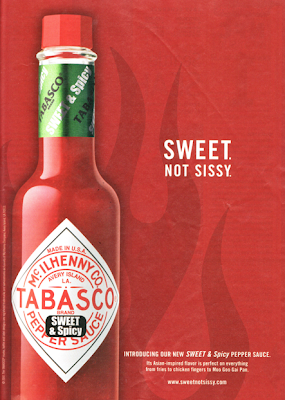 You are currently browsing posts tagged with McIlhenny Co.
Our friends at Homo Shame recently brought our attention to this advert for an all-new Tabasco hot sauce variation, asking The McIlhenny Co. its due question: Who you callin’ a sissy? …you’ll read the words “Asian-inspired” and wonder if the McIlhenny heirs use words like “Oriental” to describe their schoolmates and “ching-chong-ching” to describe the way they speak. Isn’t that right, weird racial drag lady? Isn’t that right, Misha Chan?